The light pictured here began its service in 1881 as one of the twin lights at Chatham. It wasn't until 1923 that the tower was moved to Nauset Light Beach, ending Nauset's long history of having three lights. Nauset was between the single light at Highland to the north, and the two lights at Chatham to the south. So, in 1837 Congress authorized funds to built three small lights at Nauset. These came to be know as the "Three Sisters." Henry David Thoreau thought this was a ridiculous idea, writing in Cape Cod, "they were so many that they might be distinguished from the others, but this seemed a shiftless and costly way of accomplishing that object." In 1892 the three original towers were replaced, but eventually these three too fell into disrepair, and finally suffered the ignominy of being sold for use as summer cottages. The National Park Service has restored the Three Sisters of Nauset to their original configuration, and they can be seen not far from the current Nauset Light. 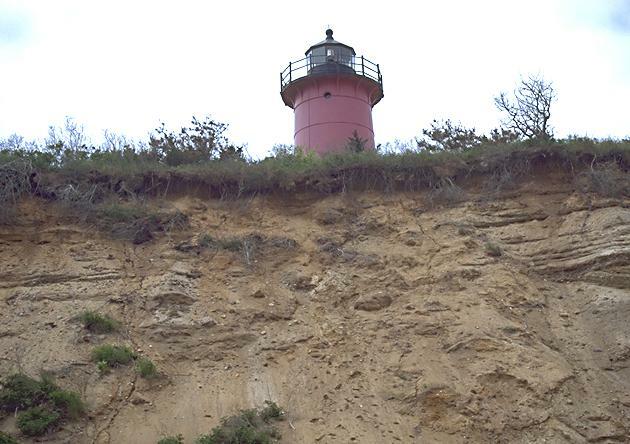 Nauset Light was recently moved a safe distance from the threat of toppling over the cliff.